Several clinical trials for lung cancer (as well as other cancers) are pursuing therapies based on the PD-1 pathway of the immune system. These trials can usually be found on clinicaltrials.gov by searching with keywords such as PD-1, PDL-1, or PD-L1. Sometimes these therapies are referred to as anti-PD-1 or anti-PD-L1. PD-1 (PD stands for Programmed Death) is part of an immune system “checkpoint” pathway that, among other functions, helps turn tumor suppression on or off. PD-1 is actually a protein expressed on the surface of certain cells in our immune system; it is NOT a mutation, but rather something inherent in everyone’s immune system. The cells of interest in these trials are activated T cells, but PD-1 is expressed on other types of cells, too. The PD-1 protein is a receptor, which means another molecule can bind to it. PD-L1 is a protein of the surface of some (but not all) tumor cells. It is a ligand of PD-1 (hence the “L” in its name), which means it binds to the PD-1 protein. When PD-L1 binds to PD-1, it tells the immune system to ignore the tumor cells. PD-1 has one other known ligand (surprisingly named PDL-2). PD-1 and PD-L1 therapies aim to blockade the PD-1 pathway so the immune system can better attack cancer tumors. The drugs used are designer molecules that bind to part of the PD-1 pathway and block its activity. Some drugs bind to PDL-1 so it can’t bind to PD-1. Other drugs bind to PD-1 to prevent ligands from binding to it. Both approaches aim for the same effect: keep the PD-1 pathway from telling the immune system to ignore tumor cells. Not everyone responds to PD-1 pathway therapies. Early trial results show lung cancer patients had response rates on the order of 10% to 18%. Researchers are studying whether biomarkers — proteins such as PD-L1 on the surface of immune system or tumor cells — might indicate which patients will respond well to PD-1 therapies. That is why some trials (but not all) require a biopsy for testing before accepting the patient into the trial. Since part of the immune response for suppressing tumors involves inflammation, participants in trials based on the PD-1 pathway often find their tumors will grow somewhat when they first start the therapy. A few lung cancer trial patients experienced serious or fatal pneumonitis, a lung inflammation. PD-1 therapies are promising enough that at least four drug companies (Bristol-Myers Squibb, Roche/Genentech, Medimmune and Merck) are pursuing them in lung cancer trials. Because they modify the immune system, the hope is that these drugs will continue working longer than targeted therapies do. Please let me know if you find this sort of article helpful. Edited 2013-09-12 12:53 PM PDT to add information. This entry was posted in Lung Cancer, Research, Science and tagged clinical trials, Hope, Lung cancer, PD-1. Bookmark the permalink. Yes, I am very interested in this line of research, and have discussed it with my oncologist as a possibility down the road. Thank you for posting! Thank you for the feedback, Tori. I wish you luck in your cancer journey. Excellent summary. Your have written a thoughtful layperson overview that is scientifically accurate and carefully presents the reported evidence. One suggestion, you could add Medimmune, since they also have a prominent anti-PD-1 therapy that is being tested for solid tumor patients. Another minor point, the anti-PD-L1 trials are technically being conducted by Genentech, which is a subsidary of Roche. So I would say ‘Bristol-Myers Squibb, Genentech, Merck, and Medimmune’. Now I understand! Thank you so much for doing this research and simplifying the processes. I hope this line of therapy is successful. I wonder if this could be used as part of a dual chemotherapy. Would that make sense? Glad this was clear. At least one clinical trial is in process that combines traditional chemo and PD-1 therapies, so yes, your idea makes sense! Thank you Squanch for doing the research . It seems like a hopeful next step when the biologics stops working! 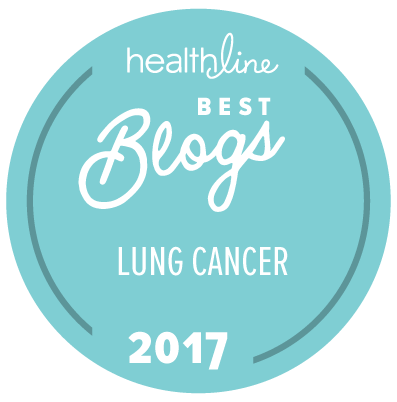 I invited Dr. Ross Camidge, Director of the Thoracic Oncology Clinical Program at University of Colorado (and my oncologist), to review this blog entry. He confirmed it’s accurate. Woohoo! Janet, thank you for this PD-1 post! Because of the great interest generated by news about PD-1, we created, a couple of months ago, a page to both explains the mechanism of action of anti-PD-1 and anti-PD-L1 agents, as well as provide easy links to the clinical trials of all these agents. I hope you’ll find it of interest. Thank you for the link, Gilles. From comments on the Inspire.com Lung Cancer Support Community, I learned that many people still didn’t understand what PD-1 was about. That prompted my attempt to write a very basic explanation. Glad to find others also seeking to demystify PD-1 for patients, Gilles. I saw you on the Lung Cancer Living Room — nice to connect your name to a face! I think we need multiple levels of explanation, because cancer patients have different levels of interest and background in biomedical sciences. I see the explanation of PD-1 on your site as the next level up in complexity; it explains more aspects of the immune system than I tried to explain. Perhaps we can build a tiered approach for cancer therapy explanations? Thanks! I’m sure this (tiered approach for cancer therapy explanations) is a topic worth a long conversation! I am currently traveling but will be back in a week. I’ll reconnect then. I find it very helpful indeed, excellent information and so easy to understand. Thanks for the feedback, Liz. You are awesome with your efforts to provide good info on lung cancer issues. I appreciate you very much. Thanks for reading and commenting, Bill. It’s nice to know my posts are helpful. My understanding of PD1 and PDL1 therapies was partially wrong. Everything is clear now. Thank you Janet. You’re welcome, Bernie! Glad it helped. My brother is in year 3 of remission from metastatic melanoma because of this trial. I find immunotherapy fascinating. As a result of his journey, I have become a licensed massage therapist who specializes in oncology massage. Thank you for this very succinct explanation.